Natural gas is transported through a series of massive underground pipes that operate much like an interstate system, providing cost-effective power that allows us to cook our food, dry our clothes and heat our homes. One of the cleanest burning fuels available, it’s an important part of both our daily lives and our economy. Using the most sophisticated computer networks in the gas transportation industry, our subsidiaries Kern River Gas Transmission Company and Northern Natural Gas work to reliably deliver that power precisely when and where it's needed. Our gas pipeline companies ranked first and second among 36 interstate natural gas pipelines in the 2017 Mastio & Company customer satisfaction index and were first among major organizational groups for the 12th consecutive year. 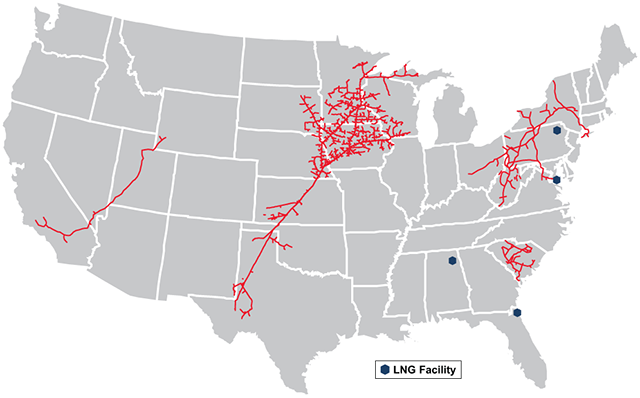 Northern Natural Gas Company owns the largest interstate natural gas pipeline system in the U.S., extending from southern Texas to Michigan's Upper Peninsula.